Celebrating Christmas in Denmark is a very specific and special experience. 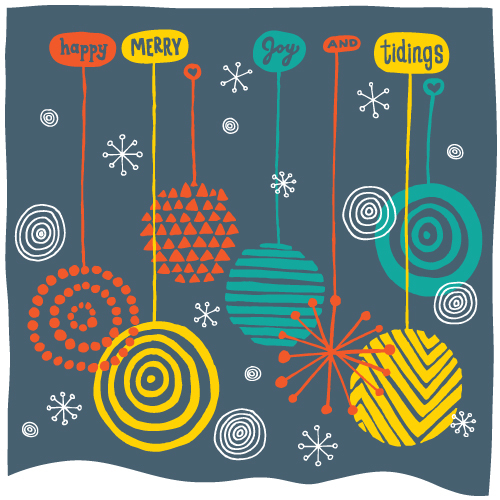 Growing up in small-town Madras, Oregon with a Danish mother afforded a chance to experience a kind of Christmas celebration bubble. While at school the preparations were All American, at home they were focused on the motherland. Making paper crafts, lighting candles on the tree, and eating the Danish holiday foods were all very different from what everybody else in town did. My sister and I happily lived in a cocoon of Nordic tradition that we shared with just each other, until I decided to move to Denmark. 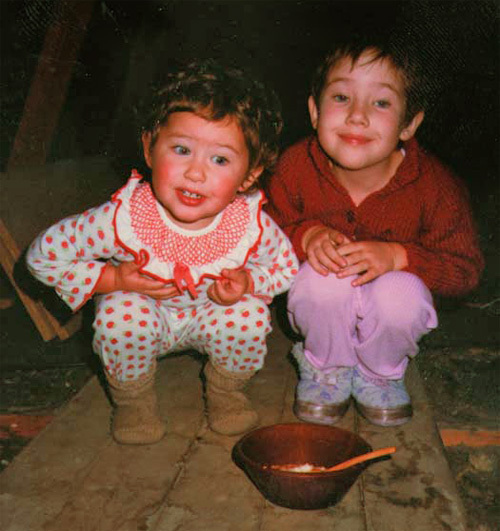 My sister and I pondering where the risengrød (rice porridge) went after putting it in the attic for the nisser (Christmas gnomes). I am the one NOT wearing a clown suit. Residing in Demmark for Christmas this year, I understand how my mother was able to hold so steadfastly to her traditions through all the years – they were ingrained in her as if it was a part of her DNA. 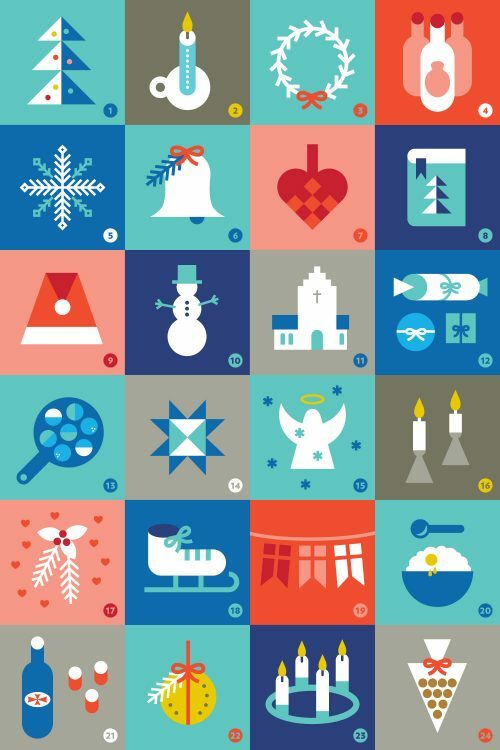 Experiencing all of these traditions as part of a group instead of just within my childhood family of four caused me to recognize the patterns and cultural norms which resulted in creating the above set of 24 icons that symbolize what almost every Dane recognizes as Christmas. In fact, the entire month of December is practically a collective countdown of the 24 days of Christmas. That Danish Christmas DNA my mother imported to Oregon has roots in a proud and nationalistic country. Denmark is a small, homogenous land that has only recently been subjected to cultural diversification through immigration. The holiday traditions belong to the people of Denmark almost as if they were a small tribe, insulated from dilution and variation in a way that is very secure and nearly ritualistic. In the USA Christmas is big, but there is always an awareness that many people don’t celebrate it or do it “another way”. In Denmark, there is no “other way” – it’s the Daneway or the highway. For example, I once asked a Dane if we could use a different varietal of jam to serve with æbleskiver (pancake balls). Hey, who cares if it’s blackberry or raspberry or strawberry jam? DANES DO. The facial response I received told me I was pretty much off my rocker for suggesting this, and I was told “Well, theoretically you could use any jam…”. Jam theory, let’s discuss. To be honest I’m still not sure if the “right” answer is hindbær or jordbær jam; I guess that’s what makes me only 1/2 Danish. Another time I ate risengrød (rice porridge) on a plate instead of a bowl to which a Dane passing through the kitchen exclaimed “My! I’ve never seen THAT done before!”. How I rock the boat in this little country entrenched in quaint and sometimes baffling rules. You got it, a Christmas tree – decorated with Danish flags and live burning candles. A large candle with 24 numerals on it, meant to burn down a little bit each day in December leading up to the 24th, when all Danes celebrate Christmas Eve. Beer you drink around Christmas. Put the word “Christmas” (jul) in front of it, and anything goes in December. Denmark is about the same latitude as Anchorage, Alaska – so the days are dark and sometimes filled with snow. Churches abound in Denmark, so the chiming of bell towers is prevalent across the land. Braided paper heart baskets that can be hung on the tree and filled with treats (esp. #24 pebernødder). On Christmas Eve, the songbook comes forth as the entire family dances around the tree and sings songs before opening presents. Sometimes, a conga line is even formed through the entire house to sing “Nu er det Jul igen” (“Now it’s Christmas again”), after which participants collapse in a heap of exertion and bellies full of duck or pork roast. 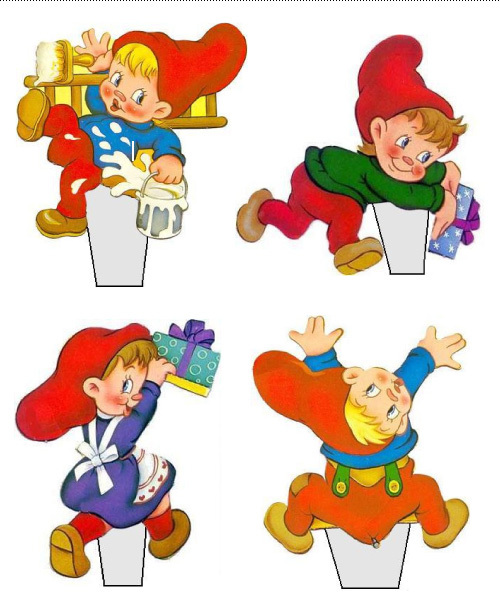 Christmas gnomes that, as opposed to US elves that help Santa, instead run around the entire holiday making mischief (an example that one Danish Christmas song documents is “peeing in the piano”). 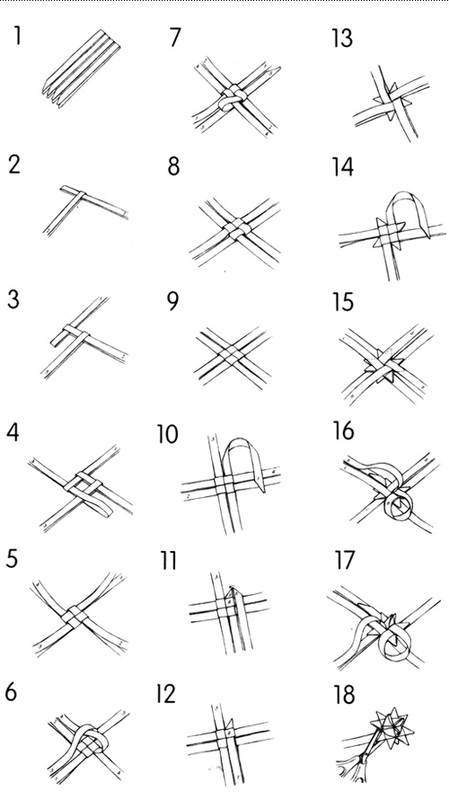 Kids who live in snowy areas somehow know how to build these suckers, no directions required. Even though most Danes pay tax to the state church (which is Lutheran), Christmas might be the only time they ever attend. A brutally competitive dice game where players steal each other’s gifts. Small pancake-like balls formed in a special pan, served with marmalade and powdered sugar. Not just any marmalade, the RIGHT KIND. Which as far as I can deduce is raspberry. A complicated paper craft involving weaving 4 strips of paper into a 3D star. Find them in churches, in snowy fields of play, or in heaven. Replicate as follows: get together with friends, make a warm drink, light some candles and have a good time. Danes are an amorous bunch from time to time – mistletoe combined with a julefrokost* (Christmas lunch) and schnapps (#21) is a dangerous combination. Town squares are often filled with ice for skating. As with any Danish time of celebration, use of flags is omnipresent and overwhelming. A rice porridge served with butter, cinnamon and sugar – often left in the attic to appease the mischievous nisser (#9). Highly alcoholic and served at all Danish julefrokost* (Christmas lunch). Take an orange or mandarin, stick some cloves in it, and hang it up with a red ribbon for an aromatic decoration. The Sundays before Christmas are celebrated by burning candles, and lots of hygge (#16). Delightful tiny cookies with a distinctive cardamom and pepper flavor, often sold in triangular bags called ‘kræmmerhuse’. I hope you can enjoy your own slice of Danish Christmas, wherever you are in the world. Glædelig Jul! *A Julefrokost is a traditional lunch that would require its own set of 24 icons. It involves about 6+ hours of eating, all supervised by a strict set of culinary rules that DO NOT involve putting herring and cheese together in any manner. 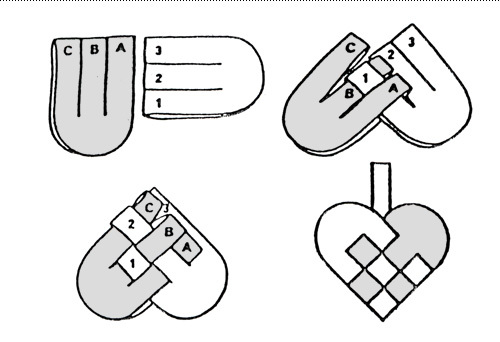 Try making a braided heart, cut out a few kravlenisser (clambering gnomes) and display them on a bookshelf by bending back the grey tab and putting under books, or attempt weaving a 3D star ornament based on this tutorial or color coded directions. Or, if you’re downright insane, try this. Make a paper braided heart basket. Kravlenisser make mischief on any shelf you put them on. Test your finger dexterity on this 3D paper star craft. Although I love designing and illustrating, sometimes it’s fun to take time off from the computer in my creative endeavors. This has resulted in many fun things, including concocting lemonade, painting a chinese waving cat, making the one and only Fullitzer Prize, whittling a derby car, crafting seven giant paper raindrops from the Yellow Pages, and creating furry monster portraits of my friends. Nothing and nobody are safe! 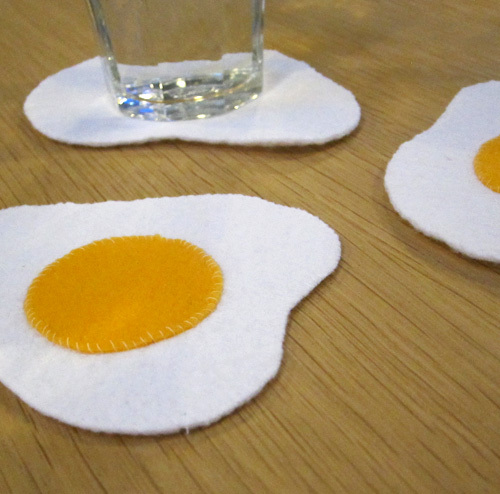 So at a recent Creative Night (an evening event where I invite people over to make things), I sewed three sunny side up egg coasters. Any surface they’re placed on automatically becomes an impromptu and unlikely frying pan. 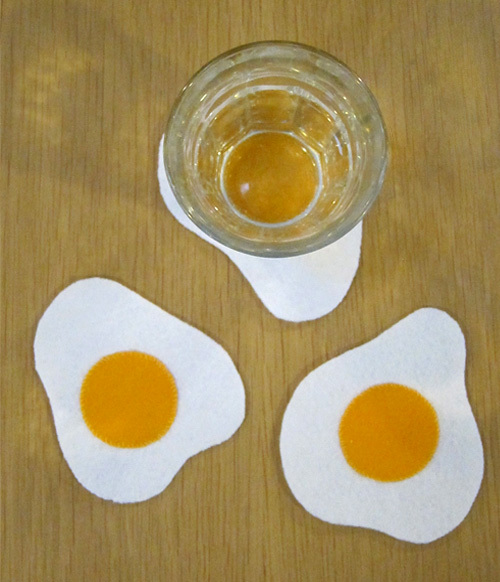 I have yet to test them on guests to see who opts for banging their hot cups down with a SPLAT and who chooses to gingerly place their beverages on the delicate yolks with care. 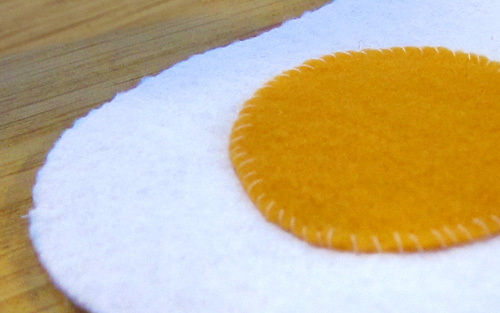 All you need are two layers of white felt cut in various shapes, a yellow or orange circle for the yolk, and some thread (white). First, sew the yolk onto the top white layer, then sew the two white layers together. Ta da! 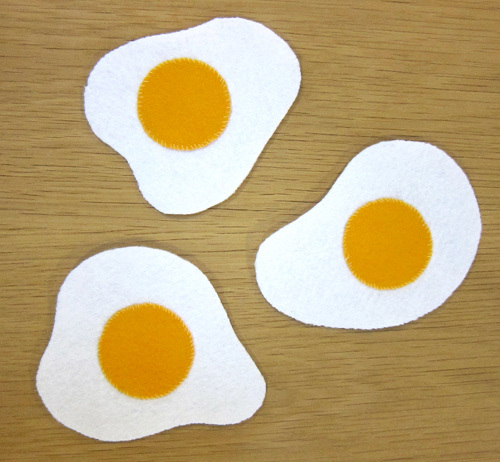 Set of three sunny side up coasters. Close up of stitching around the yolk panel.